We left Claresholm after eating a continental breakfast of terrible coffee and decent muffins. The hotel’s owner chatted lazily with us as we noshed. He had been a manager of Woolworth's department stores, from Toronto, Ontario to Terrence, British Columbia. He served the chain loyally for decades of his life, never questioning when they sent him north, east or west. They fired him after 27 years of service. He’d become redundant. I told him that I remembered eating grilled cheese sandwiches at the Woolworth’s lunch counter where I grew up. There was pride in his voice as he told me that, before McDonald's came along, the department store’s lunch counters were the biggest restaurant chain in the world. The sun was high for it being so early in the day. We heated the RV’s engine for a half hour before wheeling south. It’s a strange time to write for a living. Where normally I expect to raise an eyebrow when I tell folks what I do, my vocation of late has roused opinions and suspicions. I wasn’t sure if I would stand up to questioning at the border. I needn’t have worried: the border guard was more concerned about where we were going, how long we’d be there and whether we had any contraband onboard. In her rear view mirror, my wife saw our border guard staggering through a pee-pee dance from her booth to the border patrol facility a few feet away as we drove off. The mountains are different here than they are in Alberta. Slow and rolling, gentle and often treed to the tip. I never saw buttes until I came to this state on assignment a few years back. The landscape stayed with me. I'd love to return. Bozeman was our destination of choice for the day. Small pleasures that border on decadence were a six hour drive away. We knew where we wanted to eat. We were certain of where we wanted to drink. 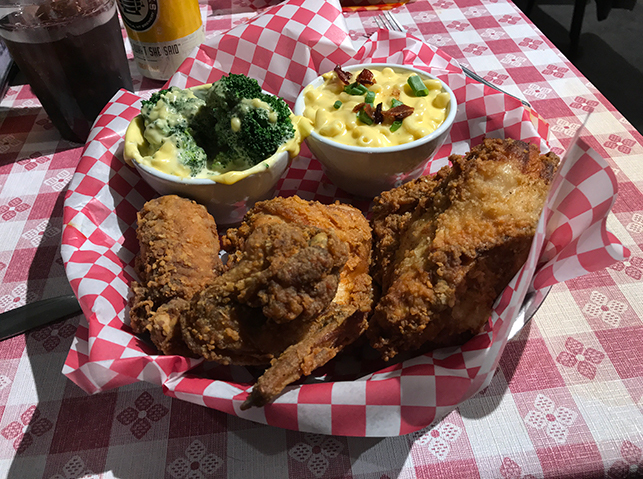 Roost Fried Chicken is the best Tennessee hot this side of the Smokey Mountains. It burns as it goes down and scalds you for hours afterwards. The Lockhorn Cider House offers a rotating score of orchids-born beverage. Most are good. Some are outstanding. We had growlers in storage for both. As my wife twisted, turned and jake-braked through the mountains, I worked to make back some of the money we’d spend on diesel to get from A to B. Silence passed smoothly between us. Her gaze was fixed on the road while I built paragraphs into something my editors would be fine with. We reached Bozeman as dusk fled the moon. The city’s streets glistened with water and ice-melt. Prowling into a mall parking lot, we stopped for the night, stretching our legs in search of food, drink and other people conversations.